Getting ready for the dyepot... 10 5yard skeins! And boy, am I aching. Seriously. But I am so excited about FINALLY getting to the point of dyeing! I'm new at it, so I think I'm going to try something a little simple (or supposedly so) like red cabbage and onion skins. I really want to see what colour I can create with the two. Yay! Gail Callahan. I'm really loving how she goes into great detail with the various methods that she mentions and gives us some great pictures to illustrate what she means. 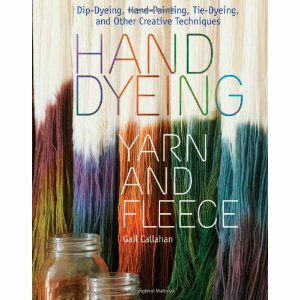 She talks a little about natural dyeing, which is what I really want to get into, but she does state that she is an avid acid dye advocate. Meh, I'm not convinced that's the way I'll go, but those parts are definatly interesting to read. Oh, did I mention my goal for 2013? I would like to get back into designing knitwear, cos I'm getting that itch again AND I finally was able to snag a copy of "A Second Treasury of Knitting Patterns" by Barbara G. Walker. 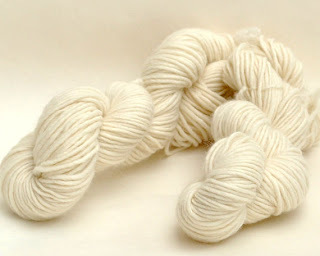 I also want to dye yarn for my designs. Colour really resonates with me, and sometimes it is what will spark a design. Or, a design will hit me, and I'll have a totally clear concept of what colour it must be in for my photo shoot, BUT I cannot find it at my local yarn shop or my favorite yarn suppliers online. So very frustrating to have to settle with a different colorway. Ha! My mom used to 'trick' us into the same sorts of situations. She would pay-us to match socks (paid per pair, of course), or do silly little chores. I'm interested to see what color yarn you end up with using the cabbage. Good luck and have fun.